Progressive Turf Equipment released the second generation Slope-Pro steep slope mower. Progressive Turf Equipment released the second generation Slope-Pro steep slope mower last year. The original model was introduced in 2012. In addition to other upgrades, the mower features the company’s Hi-Drive track design. 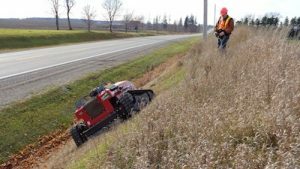 The Slope-Pro is stable operating on side slopes up to 50 degrees. It features a 52-inch wide cut with twin counter rotating blades, on-the-fly height adjustment and 0-4.5 mph travel speeds. Progressive said its Hi-Drive track system provides significant advantages over other rubber tracked or even wheel based steep slope mower designs, including additional “track on the ground,” which is designed to provide a smooth ride; a large and light footprint to minimize ground compaction; dual flange front and rear idlers and dual flange lower rollers, designed to provide track alignment and stability; an on-board jacking system that makes tensioning of the tracks simple and fast; and more. Remote mounted battery boost terminals under a lockable hood.